Hi Friends! 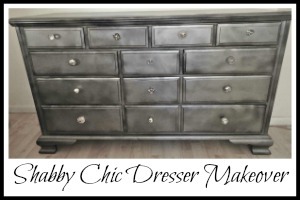 I’m very excited to share my latest DIY. 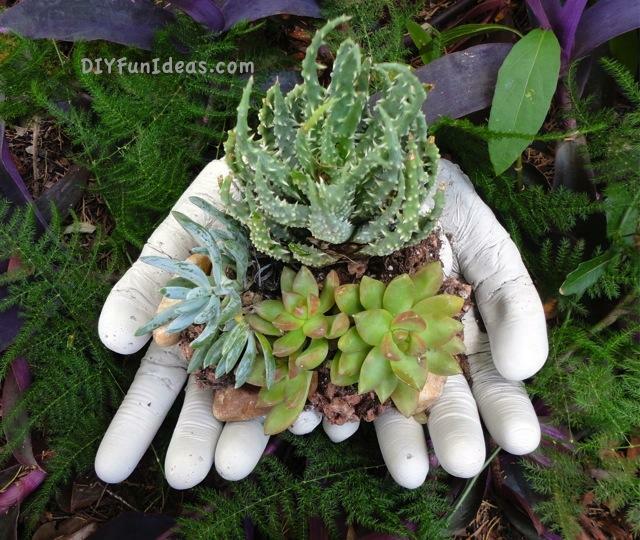 I made these really cool concrete planter hands. Use them as planters or toss your keys or spare change into them. My inspiration for these DIY concrete planter hands came from a recent feature post I did on another set of DIY concrete planter hands. I thought they were so fun. Plus, I’ve been really wanting to try making something with concrete. So this seemed like the perfect place to start. 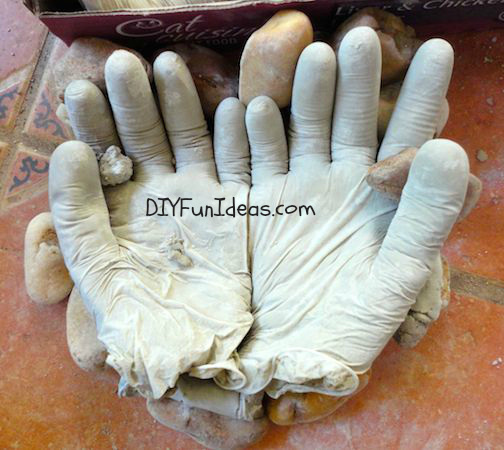 Now, while making these DIY concrete hands was super easy, I have to admit I started out with a major fail. So I’ll start by telling you a little about how you can avoid making the same mistakes. My biggest lesson learned here is that not all concrete is made equal. 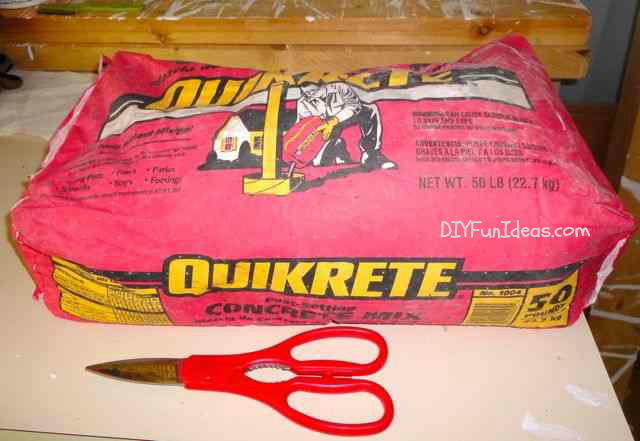 I picked up the smallest bag of concrete I could find at Home Depot. Their smallest bag was 50 lbs. But it was only $5 so no big deal. I was all ready to get started. The first thing you want to definitely make sure to do when you start is wear a breathing mask because when you pour the concrete, there is no way you’ll be able to avoid breathing in the dust that flies up. So absolutely wear a mask. 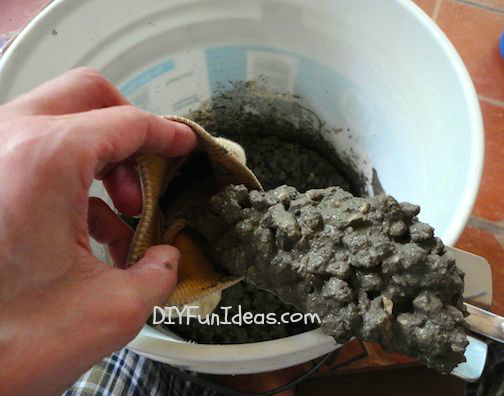 Anyway, wearing my dust mask, I went ahead and poured my dry concrete into a bucket. It was all full of rocks! Yup. Apparently, real concrete is rocks mixed with cement. Well, I figured I’d give it a try so I mixed in water based on the package instructions. Then I used a garden trowel to stuff the concrete into an old gardening glove and a few plastic gloves. I let the gloves sit over night then started cutting and peeling the gloves off the concrete. It was not looking right at all. I had made the hands of The Thing from Fantastic Four. I had definitely made a mess of it; couldn’t even get the gloves off without breaking the fingers. Total sadness. Notice that is says “casting” on it…. Using a gardening trowel again, I started filling my gloves. I found that air gets stuck in the fingers. I squeezed the fingers of the glove to push the air out and then to get the cement to the bottom of the fingers you have to sort of “milk” the fingers as if you were milking a cow. (I’ve never milked a cow, but I might be pretty good at it now.) It takes a bit to make sure there are no air pockets. I had to work kind of fast because the cement I was using starts to set in 15 minutes. I filled a total of four gloves this way. On the last two, using a scissor I cut a slit along the pinky side, pressed out a little cement and then pressed the two hands together so that they would dry as one. Then I shaped the fingers the way I wanted them and used some rocks to hold them in place. I did the same with the other two gloves I filled. The cement starts to dry really quickly and the hands got really hot to the touch. By about a half hour in they felt rock solid. But I let them dry a few hours before messing with them. Then I used a scissor to cut the gloves open and peel them off. Once the gloves were peeled off, my beautiful DIY concrete hand planters were good to go. I picked up some succulents on my second trip to Home Depot and planted them. You can also use to store your keys! Or as an interesting center piece. But this one is my favorite!!!!! 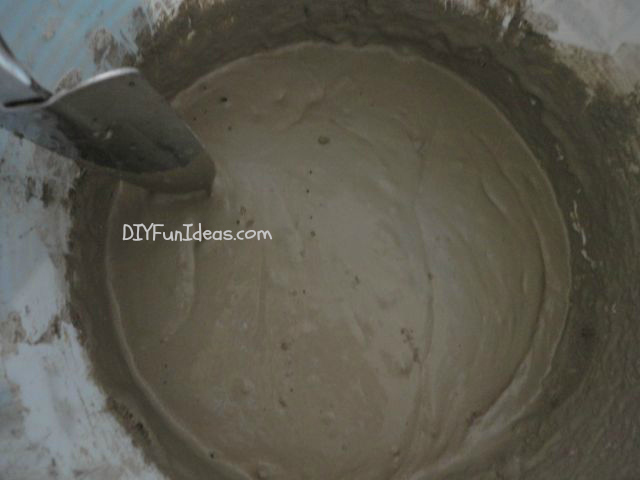 – trowel to mix & scoop the cement. 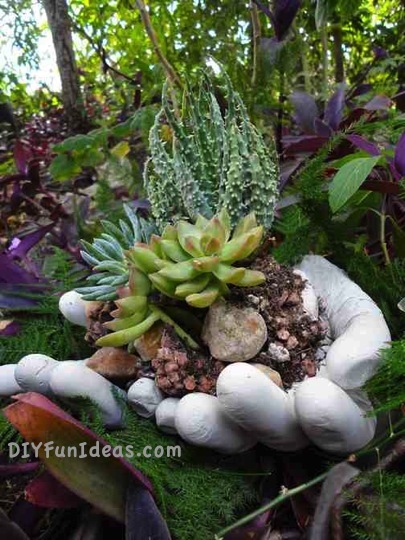 Enjoy making your own DIY concrete planter hands and bowls! 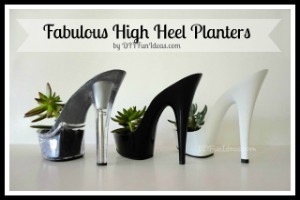 And for more planter fun, check out the Fabulous DIY High Heel Planter tutorial! What a clever idea. I know about the concrete issue, fortunately when I went to buy mine for a project, my husband was there and told me the difference. It is so rewarding when it finally works out. I just might have to try it. Thanks Beverly! 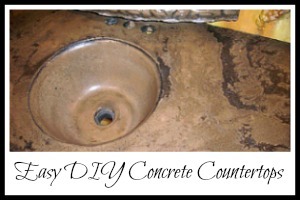 What did you make with your concrete? I loved making these and am looking for new concrete inspiration!! I have seen something similar.. take a bowl and invert it ( up side down) Place a Giant leaf over the bowl Pack concrete over the leaf.. about an inch thick . If the leaf is truly huge like and elephant ear hosta, you may want to layer a bit of chicken wire in it.. let it dry .. then roll it over… pop out the bowl.. and peel off the leaf.. and you have an awesome leaf bowl for planting or just as a bowl! Could you make larger hands by us using jeans. Tie the end of the legs together to make a (hopefully a rounded fingee.youd have to use several pair of pants but would the jeans peel off? Hmmm. That sounds like a cool idea! I tried making a pair of hands using cloth garden gloves and it was really difficult trying to rip the cloth off the dried concrete. I do think it’s possible to do with the jeans, but it will take a little work getting the jeans off. Please let me know if you do it. I think it’s brilliant! I’m trying my hand at this project. Lol. But, how did you set the gloves? In a bowl? And, also my cement is coming out of the fingers. Did you tie the ends? Ahhh im frustrated. Oh no, I’m sorry you’re having difficulty. If you pricked a hole in the end of the fingers so you can push the air out and then the concrete is getting through, you’ve probably mixed your concrete too thin. Try mixing it quite a bit thicker. Also, to set the gloves I put the filled gloves in a box and then used rocks to prop up the fingers and hold the hands in the position I wanted. You can also try putting the filled gloves in a bowl to set them in a cupped position. Let me know if this works for you. Put a dowel between the hands in the slit and it will keep the hands together. I could you also put your own hands in a pair of gloves and dip them into the morter? I wonder if that would work since you have gloves on. If it does I want to do it with my sons hands..
Hi Jennifer, I’ve never tried that so I can’t say for sure. 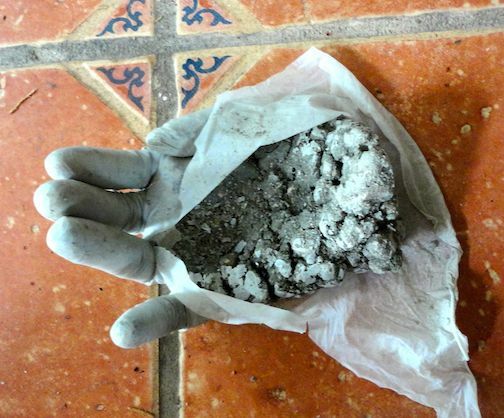 Would you let the concrete dry while the gloves are on? If you took them off while wet, I imagine that they would collapse. But if you let them dry while on your hands, I imagine that it might be hard to get them off after without cracking. But can’t say for sure. I say go for it and see how it works! Too long ago to even think about I made a hand plate for my mother. Use a disposable pie pan, fill it with plaster of paris. When set put your hand in it to make the impression. Let dry and paint. That’s such a cool idea Pamela! Might have to try that!!! I would have had the same disaster. But, it turned out so cute once you finally got it figured out. Thanks for sharing at Project Pin-it! Thank you, Denise for hosting! How i love this idea! 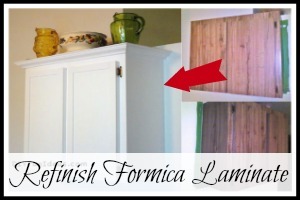 i am pinning and trying – thanks for the excellent tutorial. Thanks so much Donna! Let me know if you have any questions along the way. Wow! I think it is a great idea. I think the Zombie hands could be pretty scary for Halloween!! That was my fav! What creativity! Thanks! What a cool idea. I love how these look. Visiting from Wake Up Wednesday Linky Party. Thank you so much, Heidi! They were a lot of fun to make. Such a creative idea, I love that you used it as a planter. Glad you didn’t give up, the outcome is lovely! Love the zombie hands! Could be spookily spectacular for Halloween! Thank you! Yes, will definitely use them for Halloween too! Thank you so much! And thank you for hosting! You’re so welcome, Laura! 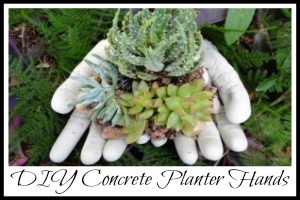 I hope you have fun making some concrete planter hands of your own! such a totally awesome idea! I am so making zombie hands!! 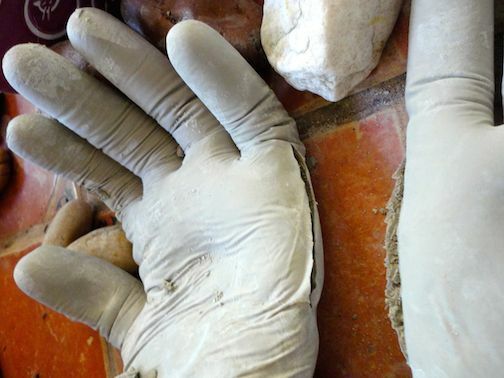 Just wondering if you used any kind of release like spray pam/oil, etc inside the gloves so they were easier to remove after the concrete hardened ? Also, maybe in the pair of hands if a couple of pieces of small diameter stiff wire was inserted in the two hands to give them more strength in the joint area ? Just a thought. They are really waay beyond cool..and I’m not a Zombie fan but the hands are so funny !! May make some to put in my flower beds as a conversation piece!! Hi jjohns! No, didn’t need any oil. The gloves peeled right off after the cement hardened. And the hands are really rock solid. The wire couldn’t hurt, but as they are now they really don’t need any additional support. It would be really hard to break them. cute and haha so many uses! Thanks for linking up with us and we hope to see you next week! Sandra from Scrumptilicious4You with the Four Seasons Blog Hop. 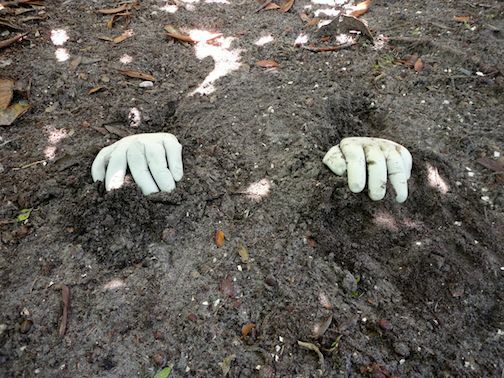 I was thinking that these are really cool but a little creepy and then you show the picture of the hands in the dirt!! Great, unique idea though and would be fun to try. Pinned! Ha, ha. Yeah, can definitely be a little creepy. I will definitely find a fun way to use them for halloween! WOW!!! 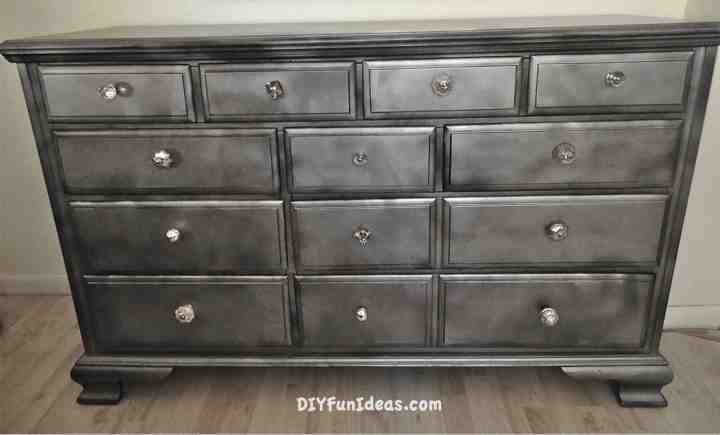 I am in DIY Heaven right now! You are AWESOME!!! 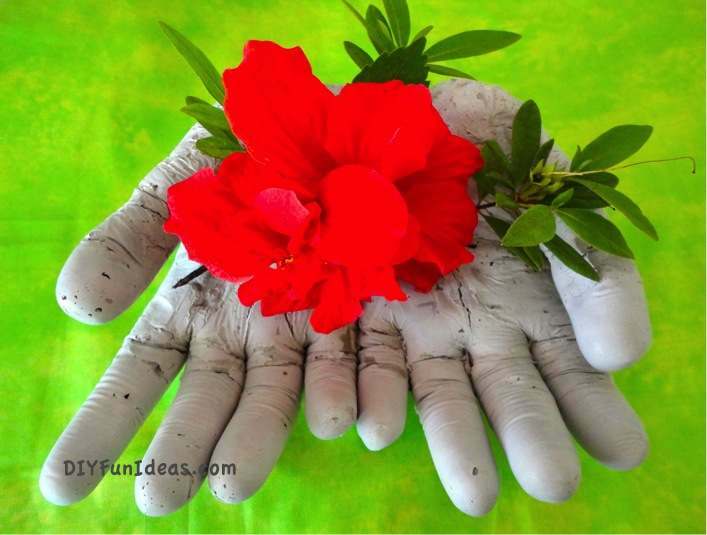 I would love to do this w/ my Mom & Daughter for 3 gens of hands!!! What a fantastic post! 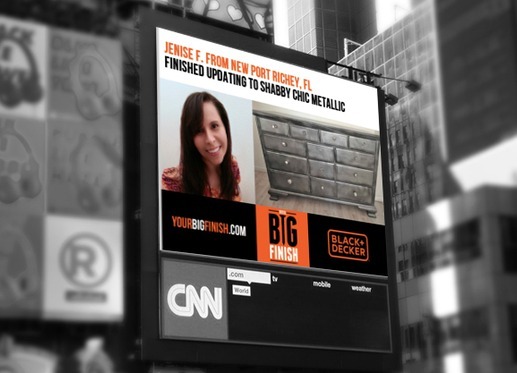 Checkin’ out the rest of your blog now!! TFS!!! Wow, Chelle. You are much too kind. Thank you very much! So clever and unique! I love this!!! These definitely would make a fun conversation piece! The type of concrete really does make a difference. Thanks for sharing with SYC. What a fun idea! Thanks for linking up to the Be.YOU.Tiful link party! super fun! zombie apocalypse hands, hilarious! These are totally awesome – I am in love with them! Thank you so much for sharing them and your great tutorial at Best of the Weekend! Pinned and shared – hope you’re having a fabulous week! Those are SO awesome!!! Sharing over G+ ! Thanks for linking it up at Monday Funday! Michelle, You are hysterical… we’re gonna start seeing zombie hands–not the hand planters! That’s awesome. What a great idea. It’s so darn cute!! I would love for you to share this at my t.g.i.f. linky party :) Have great weekend!! How fun, what a great idea. Thanks for linking up to Sweet and Savoury Sunday, stop by and link up again. Have a great day!! Thank you so much Theresa. And thanks for stopping by!!! I have been doing the concrete hands for a couple of months now, I have a whole bucket of broken hands and fingers, but I will come up with something clever to do with them. 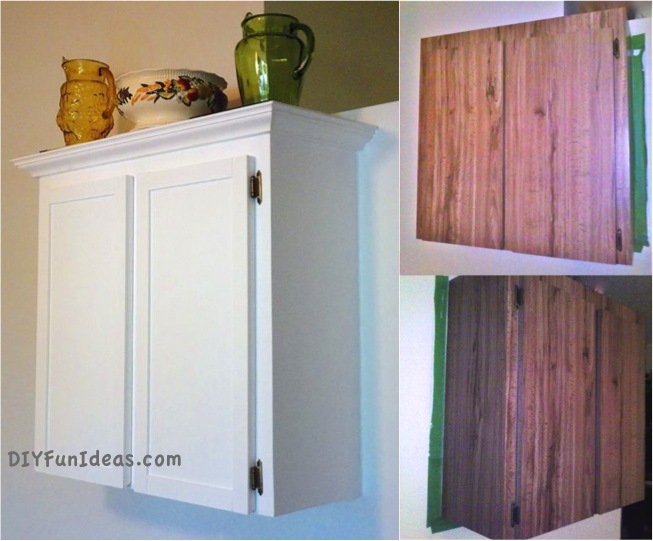 I love making them them, they are fun and an inexpensive project. I love the idea of the two hands together! I also found out early on about the rocks, UGH! I did not know there was a ‘casting concrete’-I have been using sand topper, it has a very smooth finish. I went out this morning, got the ingredients, and have some hands drying outside right now. I’m glad you showed Zombie Hands, because if mine don’t work as a little planter they will still be fun to use in the garden! Sharon, Definitely send me a picture when they’re done at [email protected]! I’d love to show them on my Facebook page!! This turned out great! 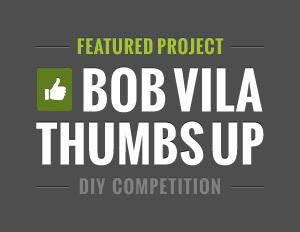 We are featuring your awesome project today at Your Designs This Time! Thanks for sharing! OMG, thank you so much! It’s an honor to be featured!!! Wow, this is amazing! I love it!! Thank you for sharing!! Thank you Kat for hosting!! I am totally loving these! What a fun idea! I wonder if they can be painted too? 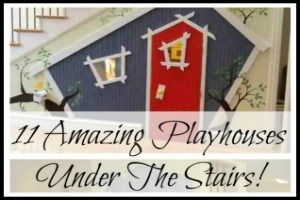 Thank you so much for linking this up at Party in Your PJs. Thank you Kim! I would imagine that painting would work just fine. Either that or you can color the concrete. 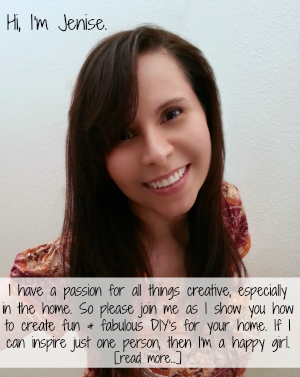 Thanks for stopping by my linky party last week, you’ve been featured at Motivate Me Monday this week!! Head on over there and grab yourself a feature button!! You deserve it! Love this idea! I did something similar with plaster of Paris and had my share of issues before I got some to work out. I like the strength of the concrete…I will have to give this a try…. Thank you so much for sharing the bad an the amazing! That sounds interesting. I haven’t done anything with plaster of paris by I’m interested in trying it as a medium. Not sure for what though. That’s a great idea Cris! 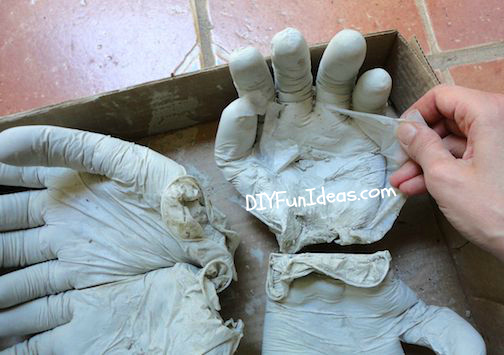 I’m going to be making some hands with my friends’ kids so they could put them in their yard for Halloween. So I think we’ll try that. Thanks for the tip! When I made my hands, I used sand to hold the shape of the fingers. I found it was easier to use and held the shape I wanted. I did have a couple of holes and I used spackle to fill the holes. After they were completely dried, I even sanded the rough edges and painted them a flesh color. That’s a great tip, Mary! I had actually used some small rocks to help me get the curved fingers. And I love that you painted them too. Great ideas. Thanks for sharing!! As the publisher of a DIY Hypertufa blog, I can confidently state that this is probably The Best of such articles that I’ve come across so far and I am going to post a link to this article on my blog shortly. Thank you so much! I just saw your post and I’m am completely honored by your kind words. I can’t wait to get to reading more articles on your wonderful site! Oh, you’ll have to let me know how your turn out Victoria! And let me know if there’s any additional questions I can answer too. Very cool! 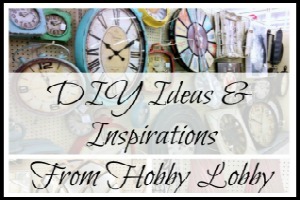 Thanks for linking up for Scraptastic Saturdays. This post will be shared via FB/Twitter/Pinterest. Have a wonderful day. Hope to see you Saturday. 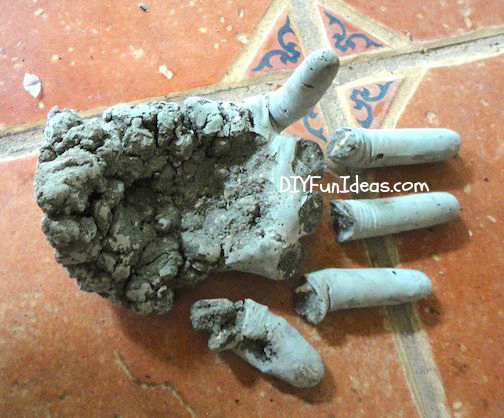 Jenise, did you have to cure your cement hands? i.e stick them in water for about a week? Hi Jen, I used Rapid Set Cement All. 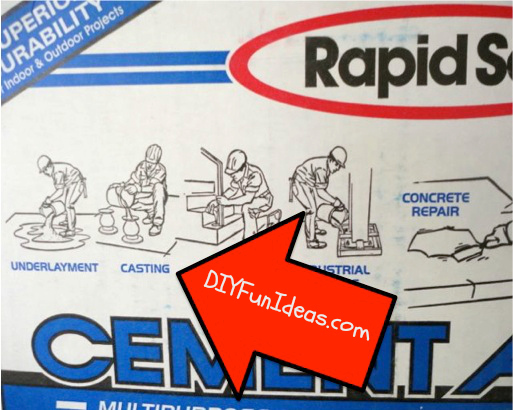 Rapid Set only takes one hour to cure and since the gloves were in plastic, that was enough to keep any necessary moisture on the concrete. Personally, Rapid Set is my favorite and I definitely recommend it. You can find it at Home Depot. This brand does set up relatively quickly though (in about 15 minutes) so make sure everything is good to go when you mix the cement. If you use a traditional portland cement mix then you will have to wait a week to cure and probably work on keeping them moist. oops one more question, up at the beginning you said you used an old garden glove and plastic gloves. Just curious, how did the garden glove work? Let me know if you have more questions. Always glad to help!! Have you tried leaving the rubber gloves on instead of peeling it off? I might try that as well. how did you get the fingernails to show up so clearly? Hi DJ! When the cement starts to harden, just give a little press down on the back of each finger. It’ll flatten it out to kinda look like a fingernail. Let me know how yours turn out! Awesome idea and can’t wait to try! Question….how thick do the gloves have to be? Are they like the thicker washing up gloves or can I use the cheap disposable ones that come in a pack of 1000? They both worked fine. The one thing that I did like better about the see-thru gloves though was that I could see when the fingers were completely filled with the cement. I wasn’t quite sure using the opaque gloves. Although they turned out fine. Also, since the yellow ones are more rigid, the creases that end up on the hands don’t look quite as natural. But that’s just me being picky I think. Very clever. I was wondering if setting the gloves in a bowl to shape the rounded effect would help in the finished product. A fantastic idea..I have seen something like this in our local garden centre selling for around £30..how much nicer to make it yourself! .definitely going to try this..thank you so much for . You are welcome Paula. 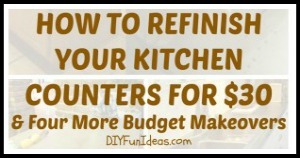 It’s also so much more inexpensive to make one yourself! I’d love to hear how it turns out! If you shaped the double hands a little differently, you could make a little birdbath to put in your garden…I’ve seen those in catalogs but making your own would be fun! I love that idea Trudi! I’m going to be making several of these to see how they do in my Etsy shop, so maybe I’ll try to do some in more of a birdbath shape. Thanks for the great idea! I made the concrete bowl using the huge hosta leaf. I put water in it got the birds and butterflies. I put it in the garage in the winter time and it has lasted many years! That sounds gorgeous Cynthia! I’m in Florida and we have some palm trees with these giant leaves and I was thinking of doing something like that with it. Hi Annette, So how did your concrete hands turn out??? So excited to hear! Once the concrete starts to stiffen, simply use your finger to put a little pressure on the area where the nail should be. That’ll flatten out the surface and give the impression of a finger nail. Hope that helps! Hi Cissy, I’ve never used Quickcrete so not sure. 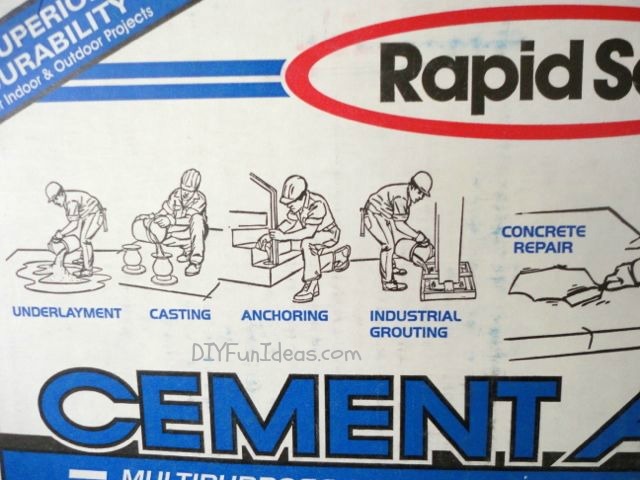 The concrete I used is called Rapid Set Cement All. And I’ve since used it for a lot of different projects including a concrete picture frame, clock, etc (all here on the blog). No offense, but the hands look kind of creepy due to the use of gloves. I take impressions of hands and other items in a medium that sets like rubber. It’s the identical material that dentists use to take molds of your teeth. You then get a real hand with fingerprints and nails. You can then use anything to fill it. 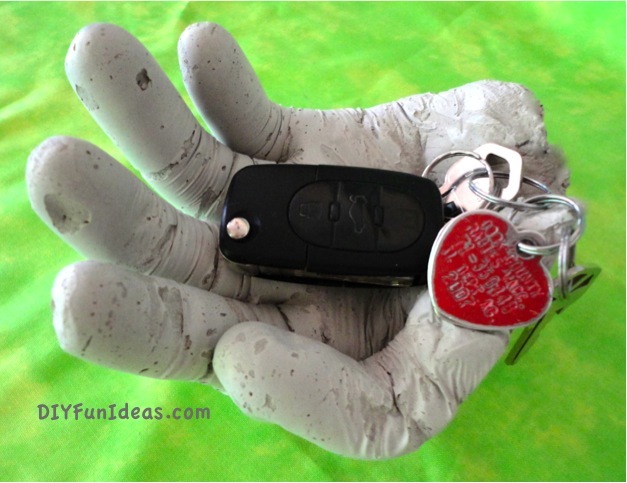 How do you get the finger nail image to come through the gloves on the cement hand project? Hi Connie, To get the finger nails I waited for the concrete to start to set and then pressed the nail area flat to give the impression of having finger nails. Any good idea of how to make 3 different size hands? I thought about making these as a grandparent gift and casting somehow my children’s hands – any advice? Hi Grace, I did a quick search online and found these extra small sized gloves: http://amzn.to/2gaZICZ. Another idea is to coat a small pair of gloves with liquid latex and turn them inside out. I’ve never tried this so can’t guarantee the final product, but it’s worth a try. Hope that helps!